Gold plated contacts for low resistance reliable connection. Oxygen free copper (OFC) cable for perfect signal transfer. Please note this is a directional cable signal IN to scart, eg from a phono sockets on a DVD player to scart socket on a TV. 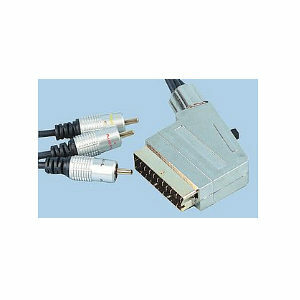 Profigold by Bandridge PGV6603 3m s-video to s-video interconnect. Enjoy superior home cinema with crisp video and vibrant colour. Features 4 pin mini din s-video connectors. Diecast connector bodies. 24k Gold Plated contacts ensures optimum signal transfer. 99.96% OFC conductor for high resolution picture quality. Cellular PE insulation ensures clean video. IAT interference absorbers for unmatched picture performance. Lifetime limited warranty against defects or workmanship. 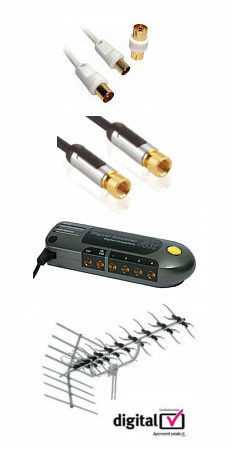 Suitable for Digital Audio and Composite Video High Quality Phono to Phono Lead Gold plated contacts, Polished chrome phono plugs. RG-59 75 ohm coaxial cable with stylish silver jacket. Please note these cables are packaged as composite video cables, digital audio cables and composite video cables are identical 75 ohm coaxial cables and can be used for either signal type. 10m White 3.5mm Jack Cable Straight to Angled Straight to 90 degree right angle 3.5mm connector both ends Stereo audio jack plug to stereo jack plug. Gold plated connectors. Colour white Length 10 metres Ideal for connecting audio devices to aux in connections Suitable for use with phones, tablets, laptops, PCs, ipods, portable audio devices and any other device with a 3.5mm audio output.